A section of the A14 to A1M in Cambridgeshire will be again be shut this weekend due to roadworks. Some 1.3 miles of the A14(M), which connects the A14 to the A1(M) near Huntingdon, will be fully resurfaced. The Alconbury Interchange Bridge will be improved as Highways England completes waterproofing and joint replacements. Work will also be done to clear vegetation, clean drains and upgrade the safety barrier to the latest standards. It is part of a package of work announced last month where similar work is now being completed further north on the A1(M) between junctions 16 and 17 near Peterborough. Highways England project manager Annette Hodgman said: “Safety is our top priority, and following earlier surveys of the motorway we realised the need to act to carry out these repairs to ensure it could remain safe for drivers, while also providing smooth journeys. The work we are doing will improve much of the road surface, including upgrading some of it to the same standard as a new road. During the weekends, the A14 northbound between Rusts Lane and the Alconbury Interchange (where the A14(M) and A1(M) merge) will be fully closed from 9pm on Friday until 5am on Monday. The work is scheduled for Friday June 29 to Monday 2 July. Following these weekend closures, there will be overnight closures (from 9pm to 5am on the A14 northbound between Rusts Lane and the Alconbury Interchange) from Monday 2 to Saturday 7 July to complete the work, with the finishing touches including replacing technology in the road and renewing the joints in the Alconbury Interchange Bridge. While this stretch of the motorway is closed, there will be a clearly signed diversion route in place directing drivers to follow the A14 westbound to junction 24 (Brampton Hut), then take the A1 northbound towards Peterborough. There will be no access to the A1(M) via the A14 northbound, and the northbound entry slip road at Rusts Lane will be closed. The Rusts Lane northbound entry slip road will continue to be accessible for local traffic, with a signed diversion route on the B1043 directing them north to re-join the A1(M) at junction 15. When Highways England is not working, lanes on the A14 will be narrowed and a 50mph speed limit left in place for the safety of drivers. All of this essential maintenance work on the A1(M) is expected to be completed by mid-July. 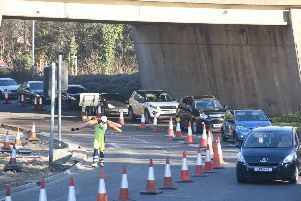 The work is being completed in addition to the £54.2 million Highways England has committed to maintaining the East’s roads over the 2018/19 financial year, complementing the £61.4 million of maintenance work the organisation either completed or begun in the last year. More than 60,000 vehicles use the 13 mile stretch of the A1(M) between Alconbury and Peterborough on average every day, with almost a quarter of that traffic being freight.